Team members from the Center for Environmental and Agricultural Policy Research, Extension and Development (CEAPRED) and the International Centre for Integrated Mounatin Development (ICIMOD) briefed the visiting delegation on ongoing activities across eight model villages in Kavre, under the climate smart village approach. 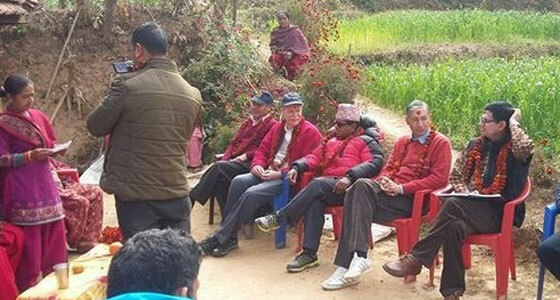 Vice Chairperson, Dr Yuvaraj Khatiwada, who also serves as member of the ICIMOD Board of Governors, observed the field testing of climate smart interventions in the pilot villages and interacted with the local stakeholders. Khatiwada said the Government of Nepal proposed smart model villages in its national development plan, and elements from the CSV approach could dovetail into the government’s concept. He also proposed the formation of a joint technical committee comprising experts from National Planning Commission (NPC), ICIMOD and partners to further develop the smart village concept, while incorporating best practices from the CSV approach. The national planning commission, ICIMOD and partners will hold further discussions on developing the smart village concept further towards development of smart organic model villages. The climate smart village concept encompasses a participatory and integrated approach to adapt to change, and fosters a sustainable development approach. It involves implementation of number of complementary technologies and practices to holistically target different aspects of livelihood security, adaptation, and sustainable development. Built around the climate smart agriculture approach seeded by the Food and Agriculture Organisation (FAO), it promotes use of simple technologies to ensure that farmers are able to easily adopt and replicate interventions. In ICIMOD and CEAPRED’s CSV approach, farmers are piloting interventions that are Nutrient Smart, Water Smart, Crop Smart, ICT Smart, Energy Smart and Future Smart. CSV is being implemented in 8 villages of Kavre district under the Himalayan Climate Change Adaptation Programme. The programme is working with 981 farmers, 813 of these farmers are women.